2018 is coming. When the people worshipping as St. Paul United Methodist Church look back at their 125th Anniversary Celebration, what legacy will they be celebrating? It is time for St. Paul United Methodist Church to move from being a “neighborhood church” to a regional mission organization. It is called to engage hundreds of people in worship each week and, more importantly, impact thousands in missional outreach. Uniquely situated between the wealthiest people and those who are struggling the most, St. Paul has been blessed by God to be able to build a bridge of grace and mercy to feed hungry children and nourish starving souls. Like the people of Israel in Joshua 1, we stand at a crossroad in the life of our congregation. One way is to try to go backward, into the desert and return to Egypt knowing that this would be certain death. The other is to move boldly and prophetically forward, crossing the raging river of culture and crisis to discover God’s preferred future. This MinistryAction Plan or MAP is the path to what I believe is God’s preferred future for us. It is bold, even daunting. 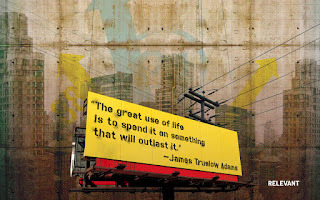 To execute this plan it will require resources we don’t have and people we haven’t met. There is the risk of absolute failure, yet that is the way God’s people have always moved. Into the unknown is where God always calls His most faithful. For eight months St. Paul convened the Vision Pathway Team to define the mission, values, strategy, and measures of discipleship for us. They prayerfully worked diligently to refine our guiding principles. This group ranging in age from the mid-twenties to the mid-seventies represented every facet of our most faithful members. I believe that God guided their every decision. This MAP has at its foundation the work that they completed. · Glorify: Intense devotion to God that demonstrates our whole life is an act of worship. · Grow: Deliberate discipleship that demonstrates holistic life transformation. · Give: Radical generosity that demonstrates all we have is a gift from God. · Go: Focused desire to invite people and take the Gospel into the streets. Worship attendance of more than 500 with 250+ being at theWest Mount location and 250+ be at one or more other locations including The Brewing Hope Café location in the heart of Rocky Mount, north Rocky Mount in or around NC Wesleyan College, southward including Sharpsburg, and westward into the Highway 97 communities. Focus will be on regional mission impact and not only on location or facilities. We will go where God leads us to go, do what God calls us to do, and work with any “person of peace” that God sends to us for greatest community impact. We will remember that facilities are tools of ministry not goals of ministry. Our goal is to change the world, to deliver people from the hell they are headed to and the hell they are living in. Utilize discipleship practices based upon information, imitation, and innovation that equip disciples to make disciples and not simply spiritual consumers. Significant improvement in the commitment of members to the mission and ministry as demonstrated by increased sacrificial giving and long-term sustainability gifts. I believe God’s word to us is the same as God’s word to the people of Israel when their challenge to enter the Promised Land seemed insurmountable. God said, “Strength! Courage! Don’t be timid; don’t get discouraged. God, your God, is with you every step you take.” 2018 is coming, it is time we get ready. A word of caution before you hit "print," it is more than thirty pages long. 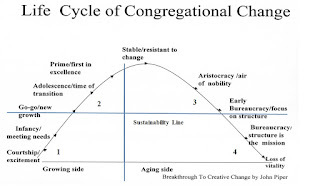 Here is Piper's Life Cycle of Congregational Change. In a recent leadership gathering the leaders determined that St. Paul was on the right side of the incline and moving downward. 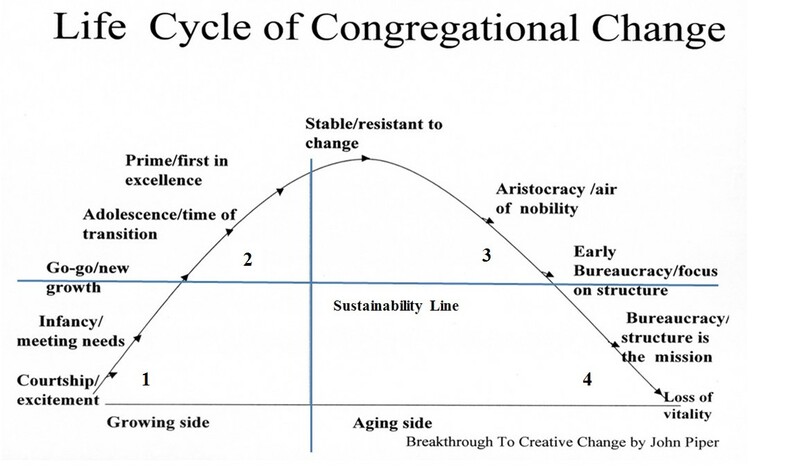 Significant change is needed. Please pray that God will lead us as we move boldly into the waters of change.